Video footage can be daunting. There are so many clips, and they all sound and look more or less alike. I’ve been there, I know. Typically, there is a 20:1 ratio from shot material to the final video. That means you have about TWENTY 30-second clips to go through for a 30-second video. It doesn’t sound like much, but much like a wine tasting, unless you’re a connoisseur, it all becomes an indiscernible mish-mash very quickly. Establish a workflow from day one. Footage takes up a hell of a lot of space, cameras auto-name the video clips, and editing software creates render files you don’t want to touch. So make sure from the get-go that everything is where you want it to be! Here are a few steps to remembering while Shooting your Video to set you up for a good edit. Figure out how your footage gets from your smartphone (or camera) to your filing system (i.e. Dropbox, Google Drive, etc). Have a dedicated hard drive for editing – you do not want to edit off your computer’s hard drive. Have a second, dedicated hard drive for backups. Establish a folder system and naming convention for the folders and keep it as a template (see screenshot examples below). Create a folder for each video project. Below an example of what my nomenclature and folder structure look like. Naming your files: I’m super particular and like to go about it in the following sequence: ProjectName_Date_Version#. If there is a job number associated with the project I put it first: Job#_ProjectName_Date_Version#. I always insist on a date AND a version number, because more often than not, you will have several outputs (renders) on the same day, especially towards the end. 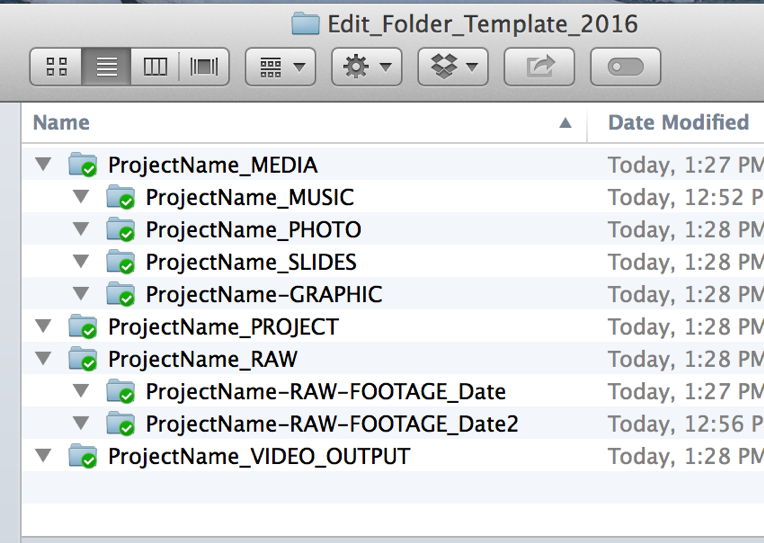 Sample folder structure for the project: “Video Marketing Introduction, May 2016”. Same folder as above, but expanded [this is a sample only, based on a real project]. If this seems a bit of overkill for a simple iPhone video shoot, I can tell you from painful experience that it’s not. When I ventured into the DIY video marketing I realized that all the set-up we do on professional shoots is equally as necessary for a DIY shoot. Here’s why: Any video recording device will name the clips you shoot at random (not random to them, but to humans), files are huge and will need to be stored on external hard drives, and professional edit software creates render files that need to have a “home”, because once they are created you do not want to move them (trust me). Be realistic about what you can handle: Keep clips super short. Stay with a single clip. Do an edit “dry-run” with a sample video clip. Try a few apps and see what you like (For guidance & inspiration. Organize your footage into folders. If you have a longer, or complex story to tell: Hire an editor. If you have little, or no time: Hire an editor. If you’re not patient and don’t love figuring out “things” (aka software): Hire an editor. Of all the careers to be explored and be had in the film business, editing is probably the one I have the most respect for. Whatever producers, directors, camera people, and a myriad of other professionals screwed up en route to post-production, needs to be fixed and made look like it was the plan all along by the editor. A good editor is as much a storyteller, visionary, and technician, and as she is a fixer, healer and diplomat. As you see in the list above, if you don’t have (or want to put in) the time to first learn and then do the actual video edit then you might want to invest in hiring a video editor. If you do go down that path, here is what you should consider when making sure you get your money’s worth. 1. What makes a good editor? A good editor is a person who can tell a story and make smart decisions. A good editor will listen and understand how to tell YOUR story. A good editor can take hours of footage (film clips) and sort through them quickly to find the nuggets. A good editor will take direction and understand your video’s context. 2. What do you look for in an editor? Look at an editor’s show-reel and sample videos. Make sure you ask them WHAT their role was on each – it can be a hodge-podge of straight editing, animation, motion graphics, sound mixing, and color correcting (these are all separate jobs in the TV/commercial world), and all of these can be done by one person on a small project. You just want to make sure you know exactly what you’re looking at and therefore, what you would be ‘buying’. In their work, listen for the quality of sound, look for smooth transitions, look at overall style, and pay attention to the quality of the graphics. If you need graphics and animations make sure they can show you samples that they created and animated themselves (don’t assume anything). Make sure you like their style. Are their videos similar to what you are looking for? If not, keep looking. 3. What do you discuss with your editor? Workflow! How do they get the footage from you or the shooter, what software are they using, and what are they giving back to you (insist on all source folders and project files (!). You want to be covered should you need to make changes and they are no longer available. Discuss the scope of work (timeline, deliverables) and their hourly or day rate (here more than anywhere else: You get what you pay for). Listen to their suggestion of how long it will take. In general, editing takes a lot longer than you would think. Make sure you have at least two rounds of changes built into your scope of work. Go over all of the above with your editor and have both of you agree to the terms in writing. 4. Where do you find an editor? Word of mouth! I’d go with recommendations from people you trust. Upwork – I wouldn’t hire under $60 an hour – give them a small job first to see how they work and if you are “compatible”. Caution about working with editors in 3rd world countries: Ask them if they have a licensed copy of the software they are using if you want source-files! (bootleg copies might crash your computer! ).I have also found that they typically work on ancient computers (after all, they charge you peanuts per hour), which means that your work will take a LOT LONGER (their machines don’t process very fast and editing can be very labor intense on a processor). The add-on time it takes them to process and render your video might wipe out the savings on hourly rate compared to a good deal in the US. 5. What does it cost? How long does it take? My 2-minute “talking-head” vlogs with graphics and titles but no music- take me about 3 hours to edit (this includes a thumbnail and graphics). It would take an editor about the same amount of time, but the product would be much better. An editor goes into multiple clips and cuts together the best parts of each (which is what you want from an editor in the first place) and that takes a bit longer, especially since they are not familiar with the footage. Most professional editors work on an eight-, or ten-hour day rate.From corporate, I’m used to paying $500 – 600 per day on the lower end. If you hire by the hour it’s going to be either a bit more, or your editor will have a minimum hourly. For one of my vlogs, I would expect to pay at least $350. But for something like that I’d likely do a ‘bulk’ deal to get a better rate and have three to five videos done at once. The difference going from a $35/hour editor to a $60/hour editor is – with a few notable exceptions – well worth the investment: Both in terms of outcome and process. Allow time for an editor to set up the edit, look at the footage and any other assets (logos, photos, graphic elements, music, etc. ), plus about 2 hours of editing for a basic 2-minute talkie video. And then allow more time for the editor to finesse all the “moving parts” – i.e. transitions, audio, music, graphics, etc. For editors, it takes a moment to find the rhythm between speech, what you see, music, and graphics. I would say a 4-hour minimum for an edit that is just a talking head video. If you have b-roll (additional footage that plays while the “talking-head” keeps talking), double that time. Finally, allow at least two hours for feedback changes and final output. As you can see, even a small edit can turn into a 10-hour affair quickly! If you have the time to invest in learning and doing your own video editing then you’re going to want to use software/applications that give you the most support. New apps and software, as well as software updates, can change the editing landscape fast. For Apple users, iPhone and Mac come pre-loaded with iMovie, which is very serviceable for a basic edit, but you will reach its limits fast. Similarly, PC’s come pre-loaded with Windows Movie Maker, which is an even more limited software than iMovie. What software do I use for video editing? A myriad of different apps: sometimes it feels like I have one for each occasion! Some are great for a quick in-phone edit and instant upload to social media (iMovie). Others are full-featured apps for longer pieces, or videos with more layering in terms of graphics, b-roll, or slides (Premiere). Some videos need lots of “love”, like fixing color-, or sound-issues, or editing away lots of runaway sentences in an interview (Premiere). Sometimes it’s just important to show someone how to edit in the most time-effective way possible (iMovie). Sometimes there’s a very specific feature you’re looking for and it’s easiest handled on a certain app (Animoto: Split screens, Magisto: Music beat-synching to cuts). Sometimes you want full control (iMovie, Premiere) and sometimes you want an app to put it together for you with the magic of Artificial Intelligence (Magisto). Premiere is the gold standard for professional editing and I use it for all the videos that I edit on my desktop. It’s superior in its interaction with any other Adobe product, in particular Photoshop, which I use for graphics and to create custom thumbnails. It can manipulate sound and layer pictures and additional stock footage easily. [Note: Final Cut Pro and Avid are still being used but compared to Premiere they are unnecessarily complicated, or not fully featured (Final Cut Pro X), or not supported anymore (Final Cut Pro 7)]. Pricey compared to non-professional software. It’s part of the Adobe Cloud software package which includes After Effects (Animation), Photoshop, Illustrator (Graphic Design), etc. Animoto is a fast, super easy to learn video editing platform. I used it a few times a year ago when my Premiere chops weren’t that great yet. I just wanted to trim a few YouTube videos to show during my presentations and workshops, and not have to go through an entire editing “process” of setting up folders and workflows. Animoto also has a few cool features like split screen templates, which are awesome if you want to produce a “how to video”. You could shoot a person explaining something in one section while showing the visual of that thing being done in another section. Magisto’s magic is artificial intelligence. This means you don’t have control over the editing, but the application does put slideshows, photos and clips together within minutes and it has a very nice music library. If you don’t care about control of your clips and the default hokey transitions (there are also templates with ‘clean’ transitions) then you will be in heaven. Mac’s integrated video software is constantly evolving and the newer versions of iMovie are full-featured enough for a non-professional video marketer who needs a few videos for her small business to make it happen and then some. Similarly, to the desktop version, iMovie as an application is also constantly updating. The changes just in the past few months have been major. Today you can perform a pretty complex edit with b-roll and audio separated from the picture. In general, iMovie is pretty full featured. If it weren’t for the graphics still being very basic and the fact that my thumbs are too thick, I’d never bother with another edit software again. 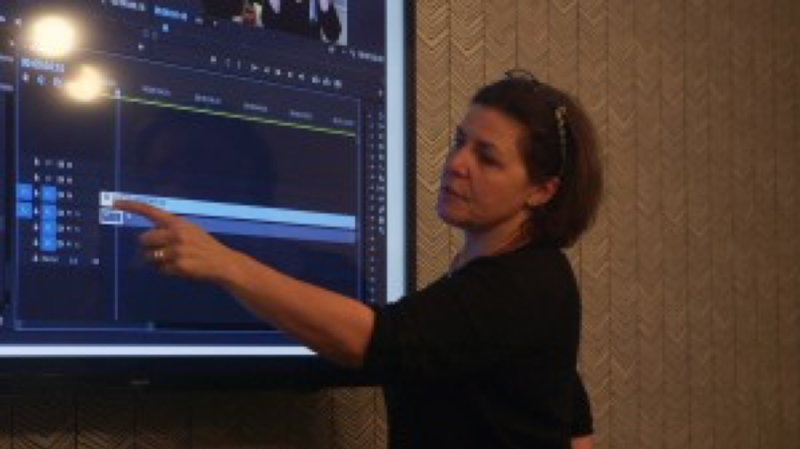 If you’re super ambitious: Adobe Premiere CC is a professional edit software within the Adobe Creative Cloud package and it’s the current industry standard. It’s well worth learning if you’re interested in editing and investing some real time and creative juice. Adobe Premiere is subscription based and belongs to the entire Adobe bundle, which features Photoshop, Lightroom, InDesign, After Effects, etc. No matter which editing software you end up using: Allow for some practice time and ‘finagling’. It takes a moment to make all the decisions: where to cut a sentence out; how to deal with transitions; if the music makes sense or not; and where the graphics go. When it doubt, keep it simple! Without going into crazy detail, it is important to get basic editing terminology right, to understand what some of the apps are offering and what some of the more advanced computer software programs are talking about. Here a very basic glossary. The links connect to our online resource blog called Definition Day, where I post definitions of video marketing relevant words each week. Today, all editing software is non-linear. Which mostly means that you can go into an edit totally unprepared and keep editing until you ‘strike gold’. As you can tell: I’m a fan of being prepared. A good edit is time-consuming with a precise plan and can be totally overwhelming and exponentially more time-consuming without one. 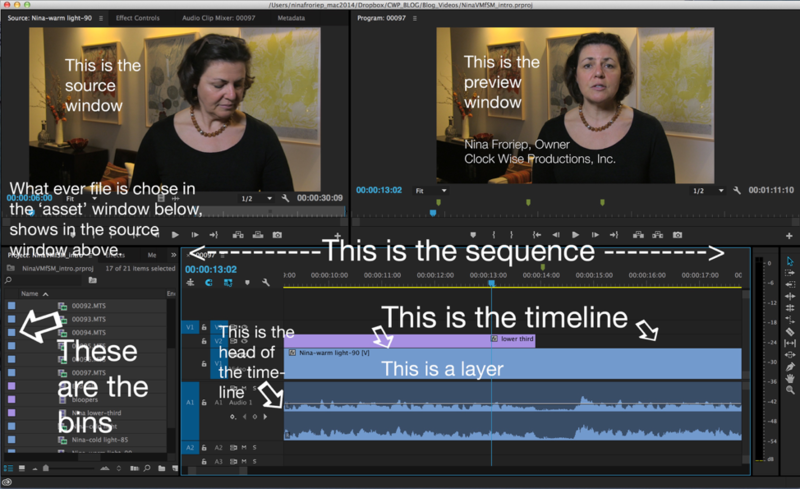 The video clips you are working within an editing software are put into a sequence, which is defined as a set of things next to each other in a set order. The timeline is the graphical representation of that chronological sequence of events (i.e. video clips strung together). A timeline starts at the head and ends at the tail. There is a linear beginning and end to the clip and any subsequent clips that are being brought into that same timeline. The different tracks in a sequence that are stacked on top of each other. A good editing software has an allowance for many (unlimited) video and audio tracks. Graphics and effects live on the video tracks. Normally the outermost track (video tracks mostly get added on top of each other) is the one being seen in the preview window. Audio tracks are ALL heard unless they are muted. 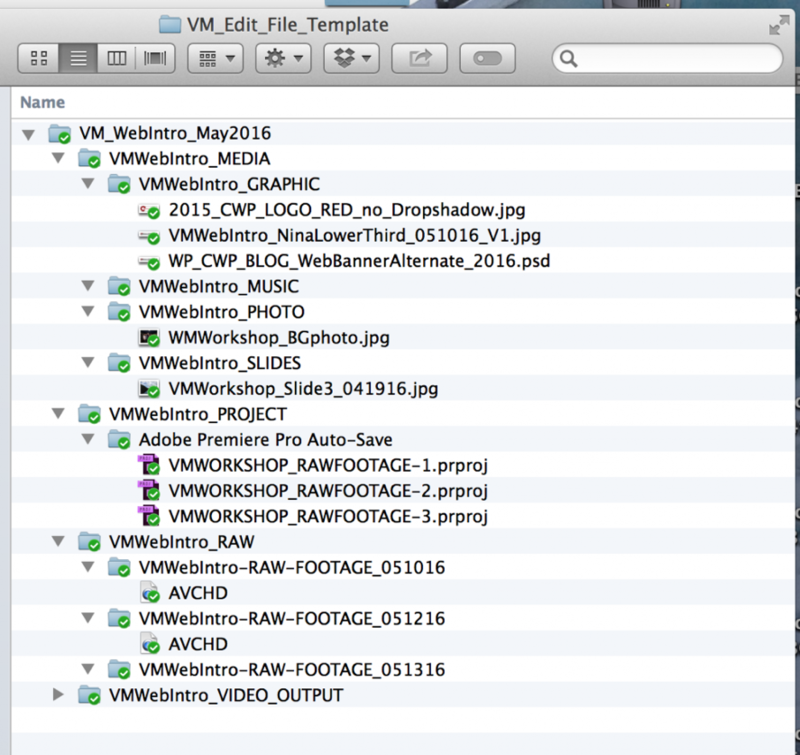 A software folder into which video clips and other editing assets get organized in. Insider fact: The term bin is a leftover from the manual editing days (not too long ago), when the editing process the physical filmstrips would be hanging from a frame built on top of a bin. The top bar of the frame had small nails every half-inch or so from which the filmstrips would hang from their sprocket holes. The bin itself would catch any filmstrips that fell off the frame. Refers to the start and end of a video clip, or a timeline, or a sequence. The tools you use to work with these windows are often in toolbars on any of the screen edges. See sample below from Adobe Premiere CC. All ways to take apart your video clips. Video transitions are used to make cuts from one clip to another smoother or to start and finish a sequence. Many in-phone apps have transitions which might be cute for social media, but really don’t belong in video marketing for businesses, unless you cater to an audience that appreciates dizzying transitions. The most common transitions are fading up from black and fading down to black. Those can be used at the head and tail of a clip, but also from one cut to another – the length of the transition can be as short as a few frames. A film strip is nothing else but a rapid sequence of still images. Classic film was played back at 24 frames per second. That was the rate at which the human eye could no longer distinguish the single frame images and perceived the flow of images as seamless. Today, in video production we mostly use 30 frames per second and, if we don’t mind a more ‘video’ looking feel, even 60 frames per second. When editing around transitions sometimes a single frame can make the difference between a smooth transition (both for audio and video), a jarring one. Looking for more lingo? Here a link to a very comprehensive (and very long) glossary of all things post-production. No matter which editing software you end up using, allow for some practice time and ‘finagling’. It takes a moment to make all the decisions: where to cut a sentence out, how to deal with transitions, if music makes sense or not, where the graphics go. Even if you end up hiring an editor, you’ll still need to invest time in finding and interviewing the right collaborator and communicating with them to get the best results. When it doubt: Keep it simple! When still in doubt: Call Nina!